Malibu Benches are constructed with 100% recycled plastic and secured with stainless steel hardware. 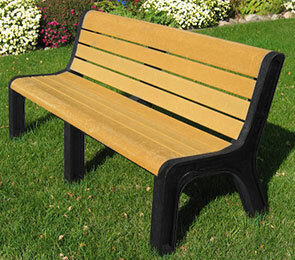 The contoured backs and seats make the benches comfortable for people of all ages and sizes, and the unique frames hide exposed ends to prevent snagging or scraping from sharp corners — making it perfect for parks, elementary schools, libraries or any facility where children may play or rest. Available in portable design or with an optional mounting bracket that can be permanently installed to deter theft. This Malibu bench will grace any outdoor setting. Choose from 4', 5', and 6' lengths.